Our dear friends at Tor Bookings are doing something very special for Halloween. 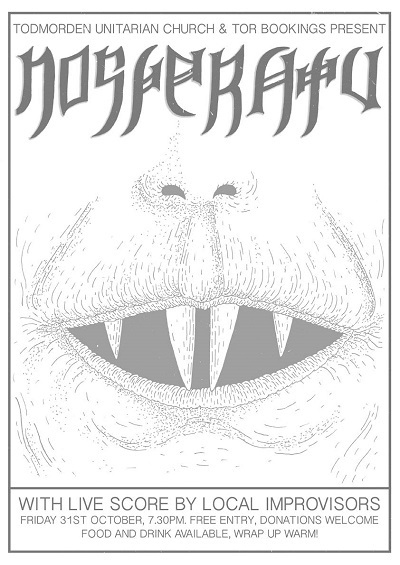 They are showing F.W.Murnau’s classic silent horror film “Nosferatu” with a live improvised experimental score by Bridge Hayden (Vibracathedral Orchestra), Sam McLoughlin (Samandtheplants) and Jake Blanchard. I’ll be doing a little DJing before and after. Its free entry, there will be food and drink available and for flip’s sake make sure you wrap up warm! Its an old church at night time and it is not going to be warm. This entry was posted in other people's events, Past events and tagged 2014, Bridget Hayden, Sam McLoughlin, Todmorden, Tor Bookings, Unitarian Church. Bookmark the permalink.